This can contains 400ml of varnish. 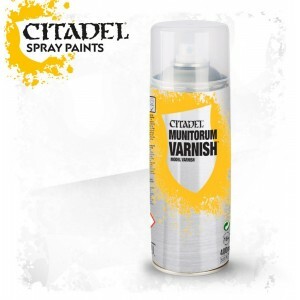 Munitorum Spray has a semi-matt or satin finish that is very much like the natural sheen of the paint itself. Applying an overall protective coating of acrylic or polyurethane varnish serves two functions. The most obvious is to enable the models to be handled without excessively wearing or chipping the paint. The other reason is to give the model an overall consistent appearance - generally to remove any unwanted shininess from inks or gloss varnish.